There were some who missed the tax deadline–if you’re on this boat, don’t fret as there are still some things you can do. File for a tax deadline extension as it is free and easy to do. Everyone is eligible to do so if you missed the tax deadline, giving you until October 15th to file your taxes through TurboTax Online, H&R Block’s online website and the IRS free file fillable forms. However, if you owe the IRS money, it is still due on April 15th, meaning that if you file for an extension, to still need to send an estimate of the taxes you owe. If you fail to do so, you may be fined or penalized–there are no penalties or fees if you file an extension and you don’t owe the IRS money. If you don’t owe money and are awaiting a refund, you won’t be receiving your refund until after you file. If you miss the deadline and didn’t file for an extension, you’ll get hit with penalties and interest. These include failure to file (FTF) penalties that are 5% of what you owe per month or partial month, and up to a 25% maximum. A failure to pay (FTP) penalty will cost you 0.5% per month or partial month, and up to a 25% maximum. When both the FTF and FTP penalties are included, the FTF penalty is reduced by the FTP penalty. 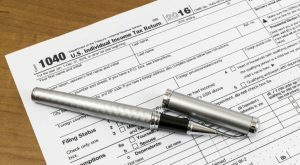 You may also be penalized for underpaying your taxes, which can cost you everything from a small fine to criminal charges as the IRS makes the determination of whether or not there was criminal intent involved. This could lead to criminal or civil fraud, negligence or frivolous return, leading to stiff fines and maybe jail time. Article printed from InvestorPlace Media, https://investorplace.com/2019/04/missed-the-tax-deadline-need-an-irs-extension/.